“Who is the Brockmann family?” They have been in Canada for 30 years making chocolates, and I don’t know about them. But here they are; right underneath my nose! The Brockmann family has been creating delicious chocolate recipes for over 80 years, and is now celebrating 30 of those years of chocolate making in Canada with the recent release of two brand new truffle flavours, salted caramel and dark sea salt truffles. I have been told that their chocolate making tradition began in the 1930’s in Munich, Germany with Willy Brockmann, a master confectioner, and his son Norbert followed in his footsteps. Norbert brought Brockmann’s Chocolates to Canada in 1986. Brockmann’s Chocolates produces their Truffini truffles and their Crunchetti snacking chocolate in Delta, BC. I have seen the wrapped Truffini around at Save On Foods, but never scrutinized the wrapper to find out where the chocolates were made until I received some Tuffini (and Crunchetti) to try and write about. With my love of BC wine I thought I would try pairing these chocolates together with 3 red wines from C.C. Jentsch Cellars, which I am also reviewing. Red wine and chocolate can be a wonderful pairing. Who doesn’t like a truffle? I was surprised to find that there are 11 flavours of these Truffini including: Cappuccino, Canadian Maple, Hazelnut Praline, Classic Milk, Lime Coconut, English Mint, Double Dark, Orange and Raspberry. I was also told that their two new flavours are Salted Caramel and Dark Sea Salt truffles. I did have one of each of all flavours, tasting them on their own, and then with 3 red wines from C.C. Jentsch Cellars. More details on that below. 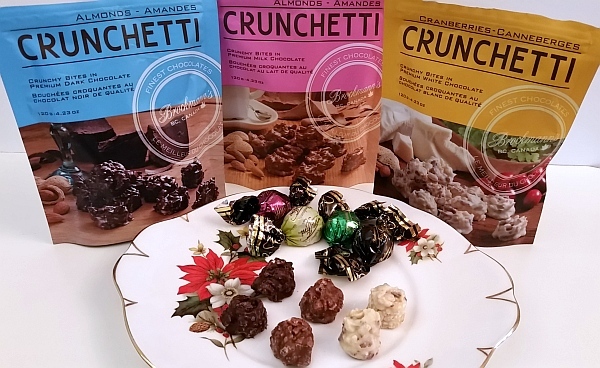 Crunchetti are Brockmann’s latest creation, and are marketed as a line of premium snacking chocolate. These crunchy, bite-size clusters come in dark and milk mixed with toasted almond pieces, and white chocolate combined with cranberries and almonds. These crunchy snacks are also found in the same stores as the Truffini and also have the same production qualities. Crunchetti: are small and take about 3 bites for me, but if you could pop a whole one in your mouth and slowly melt the chocolate and chew on the almond chunks or cranberries. None of the three flavours was too sweet for me. I do not like things too sweet, and these suit my sweetness level. The Cranberry with White Chocolate was very crunchy from the almonds and chewy from the cranberries. The cranberries did not overpower the flavour of the white chocolate. If you are a white chocolate person, give these a try. My preference is to dark chocolate, but I also like milk chocolate done well. The Milk Chocolate with Almonds and the Dark Chocolate with Almonds were also crunchy. I love the taste of the toasted almonds. The milk chocolate was not sweet like you get from many candy bars. I enjoyed the creaminess of the chocolate. The dark chocolate was my favourite. 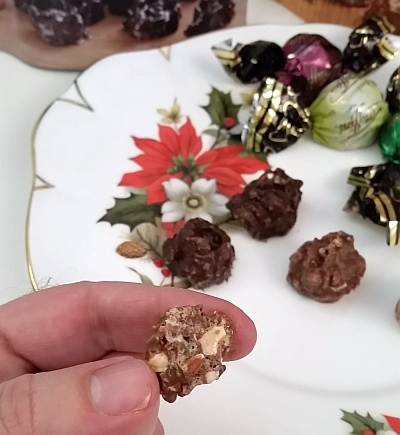 Besides the crunch, the chocolate was also smooth, and had it’s characteristic bitterness. I think I also detected a hint of vanilla. Truffini: I had a chance to try the Cappuccino, Canadian Maple, Hazelnut Praline, Classic Milk, Lime Coconut, English Mint, Double Dark, Orange, Raspberry, Salted Caramel and Dark Sea Salt. Overall these truffles also were not sweet; made for an adult level of sweetness. All had a creamy texture inside. The flavours on the wrapper were as promised. I think my favourite Truffini on their own (no wine pairing) were the Cappuccino, Hazelnut Praline, Classic Milk, Dark Sea Salt, and the Double Dark flavours. I enjoyed the crunchy, milky, bitter espresso and chocolate mix of the Cappuccino; the light toasty hazelnut paired with milk chocolate of the Hazelnut Praline; the milky chocolate mixed with a creme brulee aftertaste of the Classic Milk; the salty-bitter chocolate balance of the Dark Sea Salt, and the overall high quality dark chocolate bitterness and grittiness from high percentage cacao in the Double Dark. That being said, the wine pairings brought some other chocolates to the fore. C.C. 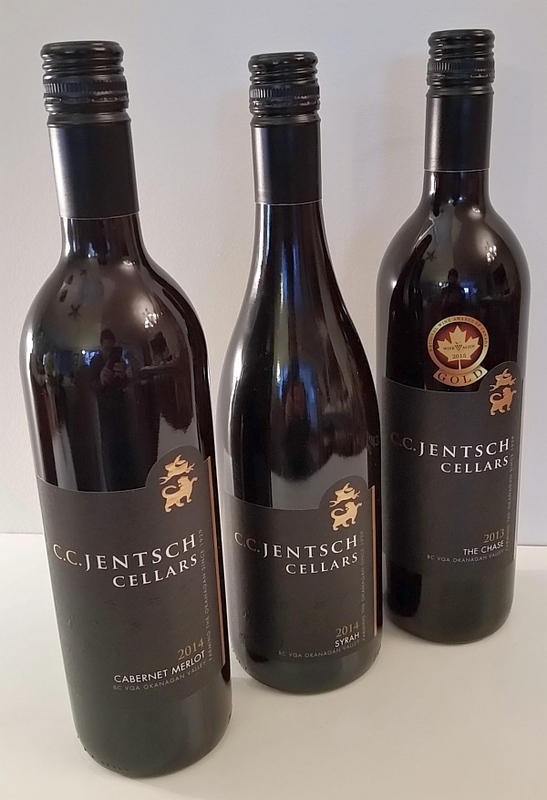 Jentsch Cellars is located in the Oliver area of the South Okanagan and have won many medals for their wines. Stay tuned for my article on these 3 red wines, plus 3 white wines from C.C. Jentsch. Without divulging too much about my review of these three wines, I can say that they are made with a light hand. They are medium to medium minus bodied, not too tannic, have red fruit flavours, and some sweet spices (from the oak barrel aging). For the Crunchetti, The White Chocolate Cranberry flavour did not fare well with red wine. I do have some white wine though to try, and will update you on that pairing with the C.C. Jentsch review. The Milk Chocolate with Almonds worked with the Cabernet Merlot the best. The chocolate smoothed out the drying tannins of the wine so that you could enjoy the fruit flavours of the wine, and the chocolate/almond flavours. The Chase wine had stronger tannins which were a bit too much for the milk chocolate. The Dark Chocolate with Almonds, is a bolder chocolate but still not strong enough for The Chase. The Cabernet Merlot was the winner again. The Syrah was an OK complement to the chocolates, but the chocolates and wine did not meld. The winner of this pairing was clearly the C.C. Jentsch Cabernet Merlot 2014. I think the reason that this wine worked the best is that the Merlot grape produces a rounder, fruitier, less tannic wine, compared to Cabernet Sauvignon, Cabernet Franc, and Syrah grapes. In general higher tannin wines with less fruit do not make as nice a pairing with chocolate, compared to a fruitier, lower tannin wine. So think Merlot when enjoying chocolate. Gamay Noir and Zinfandel may also be wines you want to try with chocolates. On the Truffini side, I was really surprised by the Raspberry flavoured dark chocolate. The raspberry flavour really enhanced the flavours of the Syrah, and was complementary to the other 2 wines. The Cappuccino Truffini brought out some smokiness in the Syrah, and was complementary with the Cabernet Merlot. The Salted Caramel was also surprising. The chocolate itself has a balance between the light caramel filling and the bitter dark chocolate exterior. The creaminess went very well with all three wines. These are my experiences, but for you things may work differently, depending on what kinds of flavours you like in your chocolates. Why not for the holidays try a chocolate and wine pairing with family or friends? I’ve given you some pointers of types of wines I think go better with chocolate, and some notes on the flavours of the Brockmann’s Chocolates. 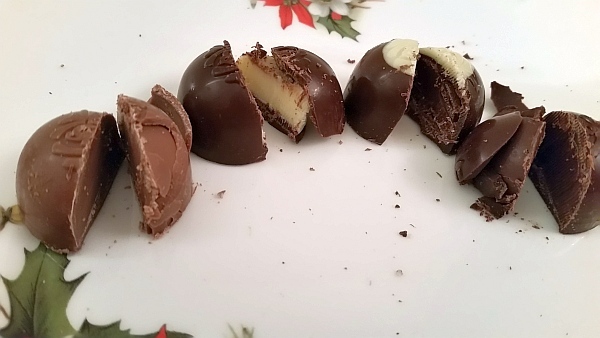 Have some fun and try these chocolates on their own and together with some wine if you dare. Enjoy and have a wonderful holiday season.